Slide behind the wheel of a race primed stock car for some high octane, adrenaline-fueled fun at Evergreen Speedway. See for yourself the speed and power that these machines bring to the table. This adventure puts you behind the wheel of a NASCAR style stock car at Evergreen Speedway. This is the perfect gift for the NASCAR fan in your life. How else can you get to hold the pedal down and push 400 horse powers of racing machine around an oval at speeds up to 150mph for an unforgettable driving experience. Your stock car racing experience begins with a driver’s meeting where you will be given instruction on safety procedures, driving techniques, and everything you need to know to prepare you for this racing experience. Once the driver’s training session is complete, it’s time to gear up in a fire-retardant driving suit, climb through the window and into the driver’s seat! Before you hit the track, a crew member will buckle you in and check your radio, so you can hear your instructor while you’re on the track. You'll get advice on changing gears and braking points the whole way through, so you can drive safely while still getting your speed up to an incredible level. High speed laps around Evergreen Speedway, a 5/8 mile Short Track Oval. Grab the wheel, buckle up and prepare for the ride of your life! 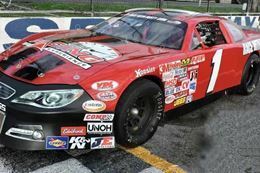 This stock car racing experience at Evergreen Speedway is the perfect unique gift for every NASCAR fan!